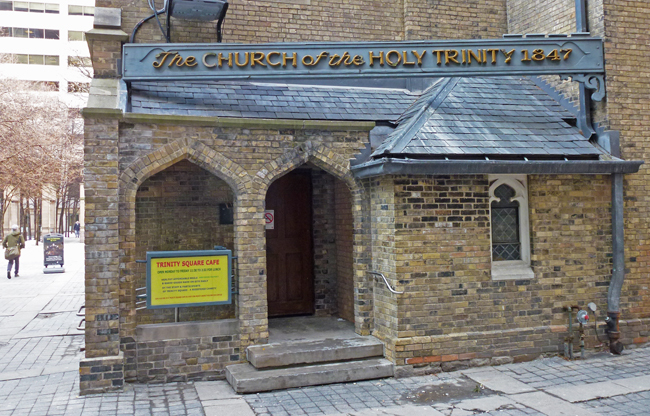 One of the important programs at the Church Of The Holy Trinity is the Trinity Square Cafe which serves reasonably priced lunches during the week. The cafe is a not-for-profit which runs as a volunteer and training program for people with mental health issues to help them to obtain work in other establishments. They serve soups, salads, and sandwiches with all of the baked goods made on site. You have me interested. My next trip to Toronto I will stop by the church for a better look. I'm liking this church more and more. Just the stone would make me cheer but this cafe is the cherry on top! Wonderful! That sounds like very good work! I've known the cafe is there, but never stepped into that part of the church. One can feel the wonderful vibes, and appreciate this companionable little church, P! They are doing good work! There is also a church here that is dedicated to helping the needy. Good actions. Oh yes, I could stop in the trinity Cafe for a cuppa. I should remember this when I am next downtown and want somewhere different to eat. I like when churches are involved with their communities. And it’s a good sign (glad we both got linked)! You can bet I'd stop to eat there! What an great cafe. I hope it is well supported by the locals.